MI5 asked Woolwich murder suspect Michael Adebolajo if he wanted to work for them about six months before the killing, a childhood friend has said. Abu Nusaybah told BBC Newsnight his friend – one of two men arrested after Drummer Lee Rigby’s murder in south-east London on Wednesday – had rejected the approach from the security service. The BBC could not obtain any confirmation from Whitehall sources. Abu Nusaybah was arrested at the BBC after giving the interview. Newsnight reporter Richard Watson said after the interview had concluded he left the studio to find officers from the Metropolitan Police counter terrorism unit waiting to arrest Mr Nusaybah. The Met confirmed a 31-year-old man had been arrested at 21:30 BST on Friday in relation to suspected terrorism offences and search warrants were being executed at two homes in east London. The arrest was not directly related to the murder of Drummer Rigby, it said. The soldier was killed in front of dozens of people near Woolwich Barracks, where he was based, on Wednesday afternoon. Mr Adebolajo and Michael Adebowale, who was also arrested at the scene, remain in hospital after being shot by police. In his Newsnight interview, Abu Nusaybah said he thought “a change” had taken place in his friend after his detention by security forces on a trip to Kenya last year. After this, he became withdrawn “and less talkative – he wasn’t his bubbly self”, Abu Nusaybah added. He said Mr Adebolajo also told him that, upon his return, he was “followed up by MI5” who were “knocking on his door”. He was “basically being harassed”, Abu Nusaybah said. “He mentioned initially they wanted to ask him if he knew certain individuals. “But after him saying that he didn’t know these individuals, what he said was they asked him if he would be interested in working for them. Reporter Richard Watson said that, in general terms, it was not out of the ordinary for the security service to approach people for information or even to act as covert sources. Mr Adebolajo, 28, originally from Romford, east London, and fellow suspect Michael Adebowale, 22, of Greenwich, south-east London, had been known to MI5 for eight years, Whitehall sources told the BBC on Thursday. Two women, aged 29 and 31, arrested on suspicion of conspiracy to murder, have been released without charge, but a man, 29, remains in custody. Speaking about the fight against the rise of the extremist ideology, Chief Constable of Greater Manchester Police Sir Peter Fahy told the BBC there had been a “steady stream of plots”, which had on the whole been foiled by police. But he said the police and the security services were “particularly concerned” about people travelling from Britain to conflict areas such as Mali, Syria and Iraq and the increase in extremist websites. 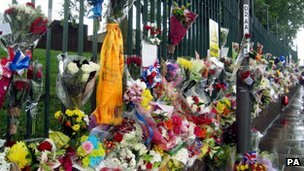 Since the murder there has been an sharp increase in the number of in anti-Muslim incidents, according to the organisation Faith Matters, which works to reduce extremism. Before the attack about four to eight cases a day were reported to its helpline, but the group said about 150 incidents had been reported in the last few days, including attacks on mosques. Mr Rigby added that his stepson “adored and cared a lot for his family, he was very much a family man, looking out for his wife, young son Jack, younger sisters, whom in turn they looked up to him”.